HP’s latest Chromebook is now available to buy in the US, and it’s a rugged convertible with a touchscreen that packs plenty in and starts at the relatively wallet-friendly price of $299 (around £220, AU$375). The HP Chromebook x360 boasts an 11.6-inch IPS touchscreen fashioned from Gorilla Glass 3 with a resolution of 1,366 x 768. Core specs include an Intel Celeron N3350 dual-core processor clocked at 1.1GHz with burst to 2.4GHz, integrated graphics (Intel HD Graphics 500), 4GB of LPDDR4 system memory and up to 32GB of eMMC storage. You also get 2x2 802.11ac Wi-Fi alongside Bluetooth, and wired connectivity includes a pair of USB Type-C ports, and a pair of USB 3.1 Type-A connectors. There’s also a microSD card reader on board, and a front-facing HD webcam is thrown into the bargain, too. Aside from the Gorilla Glass used with the display, this notebook’s other rugged attribute is a spill-resistant keyboard, which is full-size and will come in pretty handy if you accidentally knock a drink over the keys. The laptop is 19.5mm thick, weighs in at 1.35kg (2.98 pounds), and boasts a claimed battery life of up to 11 hours 30 minutes. It has a 360-degree hinge to allow for use in laptop, tent, stand or tablet modes in tandem with the touchscreen. 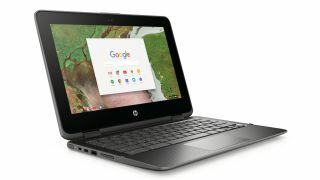 You can purchase the HP Chromebook x360 in either smoke grey or snow white colors from Amazon, Costco.com, Micro Center, Sam’s Club, Target and Walmart.com over in the States with the price starting at $299 (around £220, AU$375), as mentioned. It's been a while since we've seen a new Chromebook for consumers in earnest, making the news all the more exciting for bargain-focused laptop buyers. Is this another Chromebook to claws its way onto our best laptops list?